I’m going to briefly channel the spirit of Adam Abramowicz of The Best General, and talk about 40K via an extended analogy to an obscure, expensive sport that’s dominated by Europeans. I used to ski race, and one of the great and perpetual questions in the sport is why aren’t the Americans better at it. We have mountains, we have (relatively speaking) a massive skiing population. And yet we’re bad at alpine ski racing. Outside of the occasional star athlete, Team USA isn’t as a team a major contender. I remember one memorable race I watched where the commentators were talking about an Austrian had to shape up and start doing better, or he’d be kicked off the team. He beat every American in the race. There are lots of explanations in ski racing, but the frustration with America’s performance speaks to a general concept: In competitions of “Bring your best X competitors”, larger countries should do better than smaller countries. Is that true for 40K? 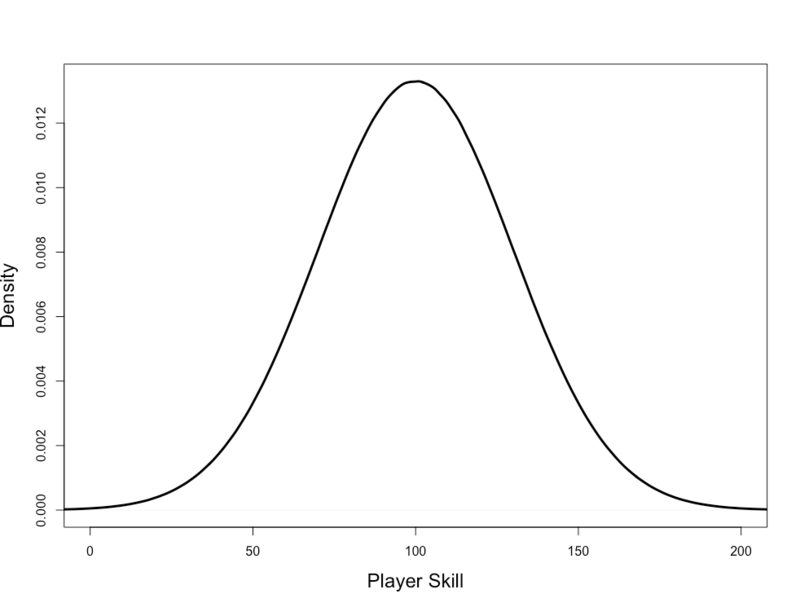 Imagine that 40K skill is normally distributed – that is, that it follows a bell-curve like distribution, where there are a large number of average players, and a relatively rare number of very good or very bad players. If you have to draw your, for example, eight best players, having more people in that “very good” tail means that you can draw more people from it. It’s easy to imagine this. For example, consider my local club versus a larger club. Our top eight active 40K players would swiftly consume all our best players, and involve drawing jokers like me, who, as Val Heffelfinger describes it, lost the moment they decided that “The floor is lava” is a useful guiding principle for making an army. A larger team can likely fill out their roster before they hit the thematic narrative players. As we can see, most players are around an average of 100, with some exceptional players near 200, and some exceptionally poor players near 0. 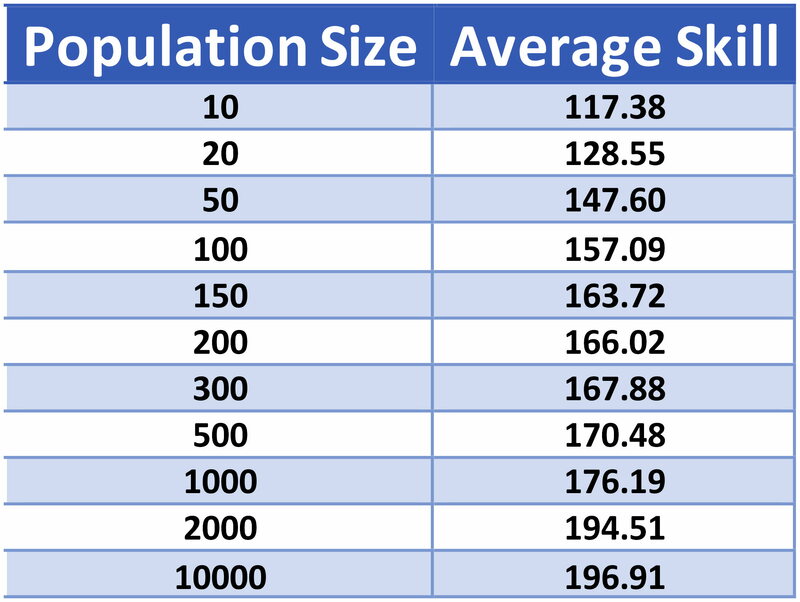 Now, what we can do is generate populations of different sizes, and ask what the average player score is for the top eight players. While we’ve talked mostly about normal distributions, if things look more like an exponential distribution (that is, nearly everyone near the average with a very long tail of good players) this general principle holds as well – and can potentially get even more extreme. So…theoretically, larger populations should result in better teams. Do the results from the ETC show this? Of course, we’re talking about the 40K playing population, but since I don’t have access to GW’s marketing data, we’re going to use overall population as a proxy. The first problem is that the United States is really big. 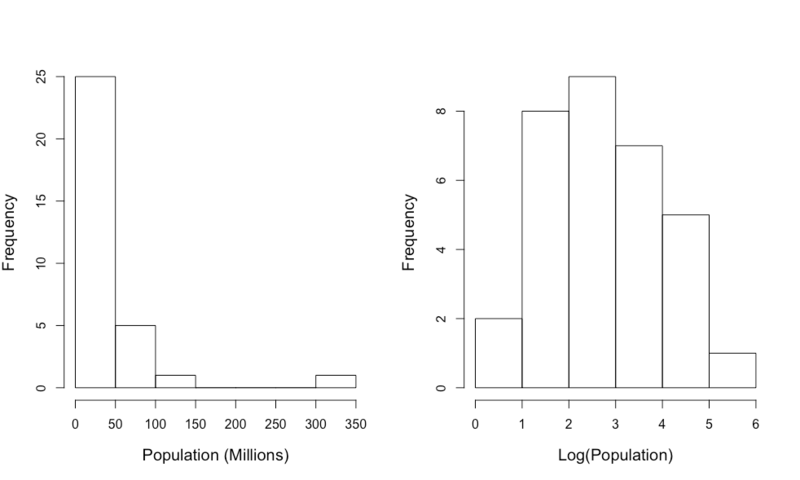 If you look at a histogram of the population in millions of the ETC countries (left), the U.S. is all out on its own. That’s a problem for most statistical methods – a lone country like that, especially if they also won, will disproportionately influence your results. Taking the log of the population is a common technique to turn data like this into somewhat more amenable forms – that’s the picture on the right. Lets take a look at the linear relationships. There it is. There’s a decided relationship for both, and in both cases, it’s statistically significant. For Battle Points, an increase in the log population of 1 means a predicted 33.51 extra Battle Points. To put that in more realistic terms, lets think about going from Canda’s population to Germany’s. Canada’s population is 36.29 million, for a log-population of ln(36.29) = 3.59. Germany’s population is 82.67 million, for a log-population of ln(82.67) = 4.41, for a difference of 0.82. 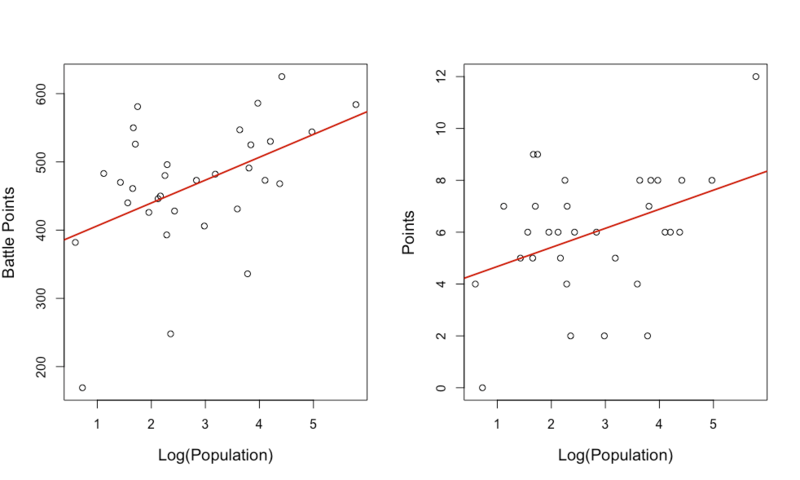 Multiplying that number by the predicted 33.51 Battle Points gained from a 1-unit increase in log population gives us: 33.51 * 0.82 = 27.45 more Battle Points predicted to Germany vs. Canada due to population size. 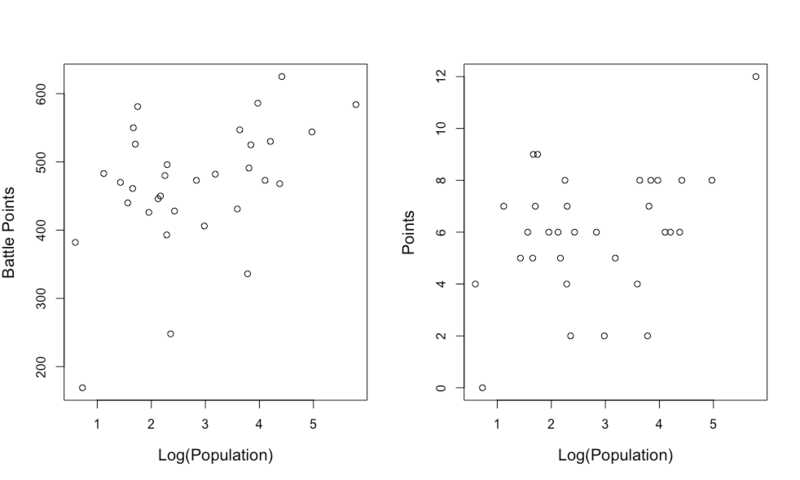 For Points, a 1-unit increase in log-population meant a predicted 0.737 more Points – but given the range of points is only from 0 to 12, that’s significant. Now, both of those don’t look perfectly linear, and ideally, we’d look at some curved prediction points, but with only 32 teams, we’re already pushing it in terms of sample size. But it does appear there is a weak-but-present influence of population size. This is, of course, not the full explanation of performance. It’s likely that UK-based teams have a much higher percentage of the population that plays 40K than other countries. And there are definitely country-level metas and personalities. And statistics like this certainly aren’t causal – but it does appear that country size confers a slight advantage in terms of being able to draw from a deeper pool of potentially skilled players. We’ll see if this holds up in years to come. Is detailed data still available for previous years? That could give you some more depth in your sample pool, and might really shift up the correlation, since this is the first time the US has won. Honestly, my dogs wanted to go play outside so I didn’t go looking very hard. Though last year’s winner was Germany, which is also one of the “larger” countries. Out of curiosity, I dropped the U.S. from the data set and re-ran everything. Interestingly, the Battle Points relationship is almost unchanged (it goes to 32.25 from 33.51), and the Points relationship is also still there, though at a weaker 0.46 from 0.737, although it’s no longer statistically significant. Which suggests that while Team USA doing really well at the ETC is a factor in this, it’s not exclusively the US doing well. Gotta give the puppies their outside time! I don’t actually doubt the result, just curious. You had mentioned it was a small sample size in your conclusion, and that seemed like it might be a relatively easy way to pick up some extra data points. Especially given the air quality today is best described as “The world smells like wood smoke”. It’s a tricky with extra years, because the samples aren’t fully independent – for example, imagine if the team for say, Wales, was the same team every year. That’s not as much information as two completely non-overlapping Welsh teams. But yeah, it would be interesting to see. Ooh, yeah, good point. I think there’s pretty much always been some overlap on most, if not all, of the teams. I remember Germany, I did some number crunching around that. For reference, Russia is the 2nd largest country in the ETC, and Germany is the 3rd. How big have you set the population of Denmark? I agree with the analysis that there is a correlation, althrough weak, between size and result. 5.731 million, which is the population from the World Bank as of 2016. I would assert that “a faint, but definitely there relationship” isn’t something I’d fairly characterize as “clear”.